Beautiful 3 bedroom condo with elevator, multiple small oceanviews, and steps from the beach! Tybee Island, just 18 miles east of Savannah, remains one of the the South's most popular destinations. Vacation homes Tybee travelers favor are typically located adjacent to the wide, sandy beaches that are often the site of special events that bring the community and vistors together. To make the most of your Georgia visit, consider booking Tybee vacation rentals that come furnished and prepared for guests intending to enjoy the area for a short weekend or for several weeks. Enter this spacious vacation rentals Tybee GA and feel right at home. You are welcomed into a light and airy living space that is casually decorated as a beach getaway. Large windows and sliding doors bathe the apartment in warm, natural light, creating a cheerful ambiance that is perfect for relaxing with friends and family during your much awaited holiday. The living area is furnished with comfortable seating facing a large screen TV. A large couch is perfect for afternoon naps or for tucking in with a good book after a day of enjoying Tybee's beaches or walking trails. A separate seating area is set off to a corner for more intimate conversations. The open plan is visually pleasing and functionally efficient with enough room for about eight guests. 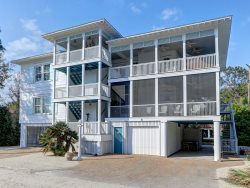 The Butler is certainly one of the larger Tybee vacation rentals that you can find. A dining area is nestled in a corner just off the full-size kitchen. The beach-themed dinette positioned under an elegant chandelier seats four, but dining won't be standing room only even when you have extra guests. The kitchen is designed with an eat-in counter with enough seating for at least another four guests. The kitchen is special compared to other Tybee vacation rentals GA. It is full size with enough counter space for several cooks. It comes with a full-size oven and stove top, microwave and refrigerator. The walls are lined with wood cabinets, which are stocked with enough cookware, dinner ware and kitchen gadgets so that you can whip up your favorite dishes or warm up some takeout anytime you wish. Between the smooth surface counters in white and the blonde wood cabinetry, this kitchen helps create that homey atmosphere. There is a bonus kitchen work space just off the main kitchen area. It comes with a small refrigerator, a microwave and enough counter space to spread out your paperwork if the need arises. A full size washing machine and dryer are provided for guest use in a utility room just across the hallway. The expansive living/dining area also opens to a patio through sliding glass doors. The patio is equipped with a cafe table and matching seats so that it becomes an extension of the indoor space in case you feel like throwing a party or you can use this space to watch the street scenes below while you sip your tea. The sleeping quarters are designed for maximum comfort. The first bedroom comes with a four-poster king bed. You'll love the luxurious linen and bedding in this room. The master bedroom comes with ample closet space and a dresser that matches the elegant bed. You'll also have a large-screen TV so you can keep up with your favorite shows. The second bedroom is furnished with a queen bed and is provided with the same carefully chosen linen and bedding. Get ready to crash as soon as you see this room because it is cozy and inviting. The third bedroom comes with double beds already made so that you have the option of spending your first free day just chilling in your vacation rentals Tybee GA. This two-bathroom apartment won't leave you wanting for space. The first bathroom is a luxurious spread with his and hers counters that occupy one side of the room. It comes with a tub and glass shower enclosure. The second bathroom is slightly smaller with a bathtub and shower combo. You'll fall in love with the special decorative touches that make this vacation rentals Tybee GA one of the best beach homes in the area. Seashell artwork, bowls of shells and beach finds, ocean paintings in every room and other beach-inspired pieces that remind you at all times that you are in Tybee - one of Georgia's most beautiful beach vacation destinations. Tybee is the easternmost point in the state of Georgia. Take the time to explore the view at the historic Tybee Island Light Station that is featured on many postcards. The Screven Historic District was important to the state's coastal defense although most of the original fort has been converted to housing. The Tybee Post Theater, Battery Garland and the Tybee Museum are still open to the public. Officer's Row refers to an area of homes that were part of the original site although the structures have been repurposed, some of which are now vacation homes Tybee. North Beach is adjacent to Fort Screven, making it convenient to finish off your day of exploration with a dip in the warm waters. The Tybee Pier and Pavilion is an amazing spot to watch the dramatic sunsets in this area although you may be fortunate enough to witness that also in your vacation homes Tybee located near the beach. For those who can schedule a trip to the area in May, the Beach Bum parade is a huge event that involves colorful floats and water gun battles on the main streets. Make sure to secure your Tybee vacation rentals early as this is part of the peak season that culminates on Memorial Day. We enjoyed our time on Tybee island. The few complaints we have are the broken tile and maintenance coming to spray for bugs while we were there. We have a toddler and it was dangerous to have cracked floor tiles and we do not allow pesticides/bug spray around him. The condo was not sound proof. You could hear neighbors and traffic from the road. Reagan and Gabe went above and beyond getting us parking passes and extra keys. Condo was great for our family. We couldn't have been any better pleased. Everything was in order and easy access. Check-in and check-out were hassle-free. We loved staying so close to the beach! Team was easy to set up accommodations. Unit was perfect for what we needed for 2 families. Stay was very peaceful and private. Hardly heard any pool noise or other people. My wife and I stayed with our son, his wife and 20 month old grandson. This was his first visit to a beach and the ocean and he decided to be fearless, so he had the biggest time with the ocean and the sand. That made our trip special, which was what we were hoping. If we decide to come again to Tybee Island, we will certainly arrange to stay here again. we had an issue with the internet service, and Jennifer spent the better part of a full day resolving for us. we truly appreciate her service.